Back Bay Books, 9780316388412, 400pp. 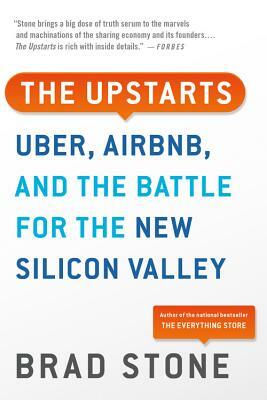 A look deep inside the new Silicon Valley, from the New York Times bestselling author of The Everything Store. Ten years ago, the idea of getting into a stranger's car, or walking into a stranger's home, would have seemed bizarre and dangerous--yet today it is as common as ordering a book online. Companies like Uber and Airbnb have redefined the way we live. And while they have become pervasive in our day-to-day lives, they are not universally celebrated. They are the result of a generation of Silicon Valley entrepreneurs who used technology to upend convention and disrupt entire industries. Led by Travis Kalanick of Uber and Brian Chesky of Airbnb, these are the upstarts, founders with an overabundance of self-confidence and a limitless drive that pushed them to rewrite the rules, better and sometimes for worse. Now with a new epilogue and updated throughout, The Upstarts takes us deep into the origins--and controversy--of these new titans of business.